Euonymus plant species come in a range of shapes and types. They include evergreen shrubs such as evergreen euonymus (Euonymus japonicus), deciduous shrubs like winged euonymus (Euonymus alatus), and evergreen vines like wintercreeper euonymus (Euonymus fortunei). Whichever you have planted in your yard, you’ll need to find euonymus companion plants that complement them. Read on for some tips on what to plant with euonymus. Plants that work well with euonymus are termed euonymus companion plants. They may look nice next to euonymus because of contrasting shape, texture or color. The first step is to evaluate the euonymus plants growing in your garden. Are they vines or shrubs? Do they lose their leaves in winter or are they evergreen? What color is the foliage? What do the flowers look like? Once you identify the characteristics of the plants you already have, you are ready to begin a search for euonymus plant companions. Whatever euonymus species thrive in your yard are obviously a good fit for your climate. You’ll need to find euonymus companion plants that also grow well in your area. 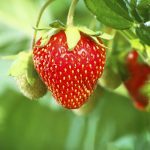 The U.S. Department of Agriculture has made figuring this out a little easier by developing a hardiness zone system. It divides the country into zones based on climate and winter temperatures. Find out what zone you live in and only consider euonymus plant companions that are appropriate for that zone. Pick plants that contrast with your euonymus shrubs or vines. 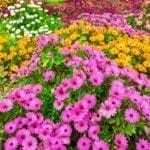 For instance, if your plants are basically green without any berries, flowers or frills, consider companion plants that offer a little flash. Bright flowers are one way of achieving this contrast. Designers recommend underplanting evergreen shrubs with flowering bulbs to brighten up the garden in spring and summer. Emerald ‘n’ Gold euonymus. These lovely shrubs have variegated leaves with a hint of pink coloration during the cold season. Don’t forget that green foliage is not all the same color. Simply using shrubs in differing shades of green may provide sufficient contrast. You can also plant shrubs with contrasting shapes. Mix columns with mounding forms and pyramids with carpet forms. 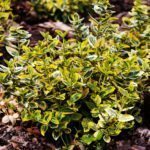 Essentially, plants that work well with euonymus in your yard are those that are different in some way from your shrubs or vines. It’s the contrast that counts. Read more articles about Euonymus.